Schedule a demo today to witness the power, flexibility, and efficiency of eLogger. Below is an example of how eLogger is being used in a national laboratory setting by Laboratory Shift Superintendent (LSS) and Control Center Assistant (CCA) staff. The LSS Routine Checklist is completed by each shift which equates to two completed checklists daily. Checklist is used to provide a record and to identify issues of specific equipment and duties required for each LSS/CCA. 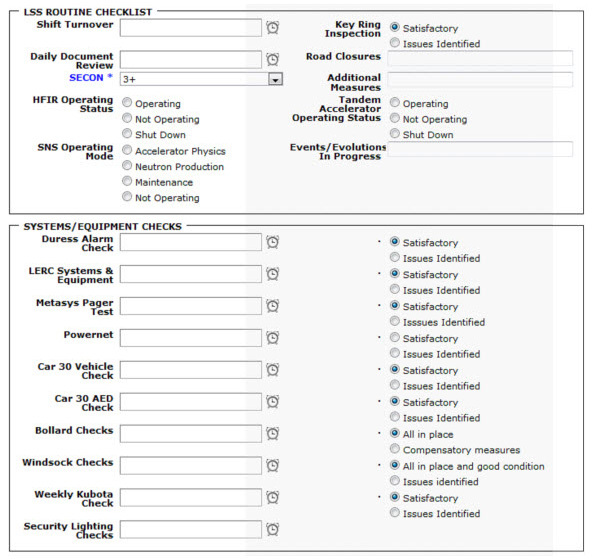 Checklist was developed to reduce Log entries for redundant check and inspections which expedited log review especially for weekend and holidays.